Since Japan’s economic recession began in the 1990s, the female workforce has experienced revolutionary changes as greater numbers of women have sought to establish careers. Employment trends indicate that increasingly white-collar professional women are succeeding in breaking through the "glass ceiling", as digital technologies blur and redefine work in spatial, gendered, and ideological terms. 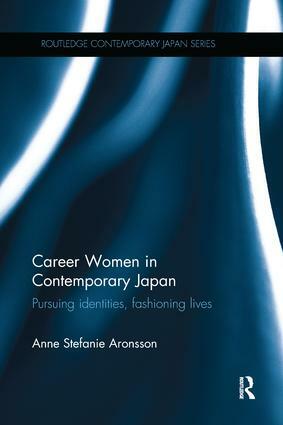 This book examines what motivates Japanese women to pursue professional careers in the contemporary neoliberal economy, and how they reconfigure notions of selfhood while doing so. It analyses how professional women contest conventional notions of femininity in contemporary Japan and in turn, negotiate new gender roles and cultural assumptions about women, whilst reorganizing the Japanese workplace and wider socio-economic relationships. Further, the book explores how professional women create new social identities through the mutual conditioning of structure and self, and asks how women come to understand their experiences; how their actions change the gendering of the workforce; and how their lives shape the economic, political, social, and cultural landscapes of this post-industrial nation. Based on extensive fieldwork, Career Women in Contemporary Japan will have broad appeal across a range of disciplines including Japanese culture and society, gender and family studies, women’s studies, anthropology, ethnology and sociology.